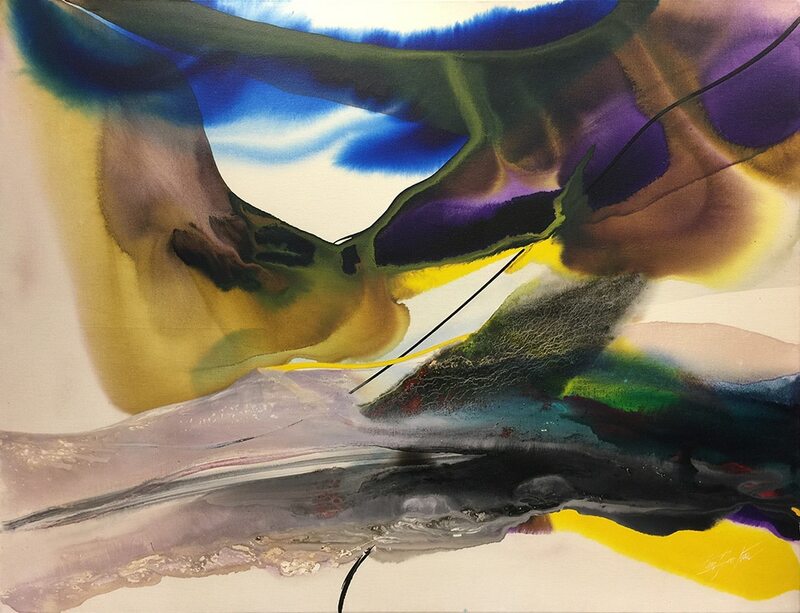 Paul Jenkins was born in Kansas City, Missouri. At an early age, he studied at the Kansas City Art Institute, and created watercolors he called “interior landscapes,” reminiscent of caves he visited in the Ozarks and other forms in nature. Through his frequent visits to the Nelson-Atkins Gallery of Art, he was profoundly influenced by the renowned collection of Eastern works, notably by the monumental Chinese fresco of Buddha, the polychrome sculpture of the Bodhisattva Kuan-Yin, Indian bronzes and meditative statues.Jenkins’ pursuit of his art was strong when, in 1944, he entered the US Naval Air Corps where he served as a pharmacist’s mate. During this time he painted watercolors of Kabuki dancers and made what the late distinguished art historian Albert E. Elsen described as “Durer-esque” black and white graphite drawings. He was also drawn to the teachings of Lao Tse Tung in the Tao Te Ching. After his discharge in 1946 from the US Naval Air Corps, Jenkins studied playwriting at the Carnegie Institute of Technology in Pittsburgh and continued a solo pursuit in drawing and painting. Under the G.I. Bill, he studied with Yasuo Kuniyoshi for four years at the Art Students League in New York and met Mark Rothko, as well as Jackson Pollock, with whom he remained friends. In 1953 he traveled to Europe where he was deeply moved by the works in the Prado in Madrid, Spain. During his stay of several months in Taormina, Sicily, he worked in oil on canvas. Later that year, Jenkins settled in Paris, and came to know Jean Dubuffet and, soon after, Michel Tapié, Pierre Restany, Kenneth B. Sawyer, among others. In 1954, he met Martha Jackson in Paris and traveled to the Venice Biennial. He began to study Carl Gustav Jung’s Psychology and Alchemy and the I Ching: The Confucian Book of Changes. In 1955, the artist traveled from Paris to New York where he came to know Willem de Kooning, Franz Kline, Ad Reinhardt, Robert Motherwell and visited Mark Rothko’s studio on the West side, near what is now Lincoln Center. In 1956, the Martha Jackson Gallery held Jenkins’ first solo exhibition in New York. Before returning to Paris, Jenkins visited Jackson Pollock’s studio in Springs. In addition to his exhibitions with the Martha Jackson Gallery, Jenkins exhibited in group shows at the Museum of Modern Art, New York (1956); the Whitney Museum of American Art, New York (1957, 1958); the Pittsburgh International at the Carnegie Institute Museum of Art (1958), Corcoran Biennial, Washington, D.C. (1958); Gutai Osaka Festival (1959), as well as Arthur Tooth & Sons, London; Galeries Stadler, Rive Droite and Arnaud, Paris. In late 1957 for two years, he exchanged his Paris atelier for Joan Mitchell’s New York studio at St. Mark’s Place where in 1959 he painted the Eyes of the Dove series on canvas. In early 1960, Jenkins began gradually to work in acrylic and to use an ivory knife to guide the flow of paint on canvas. He studied the works of Kant and, influenced by Goethe’s theories of color, began to title his paintings Phenomena followed by a key phrase or word. In 1962 Jenkins met Albert E. Elsen, who would later write the artist’s monograph published in 1973 by Harry N. Abrams. In November of 1963, he moved into Willem de Kooning’s loft at 831 Broadway where he worked until the end of 2000. Jenkins’ first retrospective took place at the Kestner-Gesellschaft in Hanover, Germany in 1964. That same year, he traveled to Japan where he worked with Yoshihara and the Gutai in Osaka, followed by travel to India and, in 1966, to Russia. In 1966, the film Paul Jenkins at Work: The Ivory Knife, received the Golden Lion Award in Venice and was shown at the Museum of Modern Art in New York. In 1967, Jenkins received the silver medal at the Corcoran’s 30th Biennial, and from 1968 to 1970, created a series of unique glass sculptures in Murano with Egidio Costantini. During this decade, granular veils appeared in his works on canvas and he continued his exploration of monochrome paintings, including grisaille. He participated in group exhibitions at the Walker Art Center, Minneapolis (1960), Solomon R. Guggenheim Museum, New York (1961); Royal Academy of Arts, London (1962, 1963); Tate Gallery, London (1964), Institute of Contemporary Art, Boston (1965), Corcoran Gallery of Art, Washington, D.C. (1966, 1967), the Pittsburgh International at the Carnegie Museum of Art (1967), Museum of Modern Art, New York (1967); Musée du Louvre, Paris (1967), among others. In the early 1970s, the San Francisco Museum of Modern Art and the Houston Museum of Fine Arts held a retrospective exhibition of his works on canvas. The Corcoran Gallery of Art initiated in 1972 an exhibition of his watercolors which traveled across the US, and in 1973, he was awarded an Honorary Doctor of Humanites from Lindenwood College in Missouri. In 1974, the Musée des Beaux Arts of Charleroi in Belgium held a retrospective. Emerging from this decade along with major large-scale works on canvas were lithographs, watercolors painted en plein air in the Caribbean, autobiographical collages and sculptures in stone and bronze, including Meditation Mandala currently on view in the Hofstra Museum Sculpture Garden. He participated in group exhibitions at the Palazzo Ducale, Venice (1970); Krannert Art Museum, Champaign-Urbana (1971); Albright-Knox Gallery, Buffalo (1975); Archer M. Huntington Gallery, University of Texas at Austin (1976); Solomon R. Guggenheim Museum, New York (1977); Centre Georges Pompidou, Paris (1977); Whitney Museum of American Art, New York (1977), among others. In 1980, France named Jenkins an Officer of Arts and Letters, and the Palm Springs Art Museum held a retrospective. In 1982, he received the Humanitarian Award from the National Committee of Arts for the Handicapped. By 1983, France had named Jenkins a Commander of Arts and Letters. Also in 1983, Harry Abrams published his autobiographical monograph, Anatomy of a Cloud, and in 1987, the Musée Picasso in Antibes mounted a retrospective of his works on canvas. During that year, the Paris Opera staged his dance-drama, Shaman to the Prism Seen, featuring two original monumental works on canvas painted by the artist for the stage, together with five tall works on canvas also painted by the artist. The following year, Jenkins was commissioned to travel to China where he painted silks for a performance at the Great Hall of the People and for the Great Wall. In 1989, the Museums of Nice presented the original painted décors from the Paris Opera, together with related watercolors. 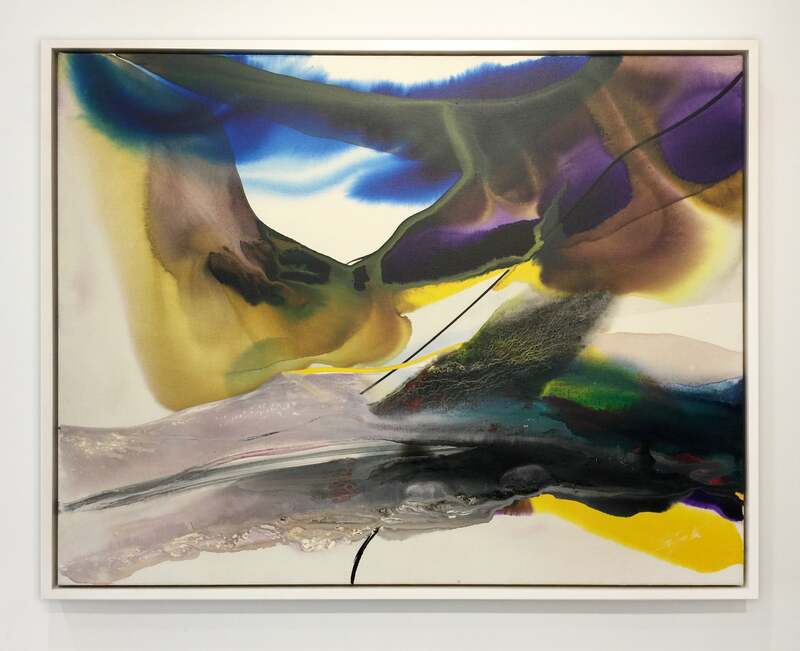 Throughout the 80s, Jenkins participated in group exhibitions at the Brooklyn Museum of Art, Brooklyn (1984), Guild Hall Museum, East Hampton (1984), National Museum of Osaka (1985), Musée Rath, Geneva (1986), Australian National Gallery, Canberra (1987), Duke University Museum of Art (1988), L’Ecole des Beaux-Arts, Paris (1989), among others. In the 1990s, Jenkins was invited to travel to Israel, and also visited Japan where his painted silks from China were integrated on stage by director Tadashi Suzuki. Polyptychs on canvas were shown in New York and London. The watercolor exhibition L’Eau et la Couleur, including watercolors relating to the Paris Opera as well as large-scale, was inaugurated in France where it traveled for two years. In 1996, he was awarded an Honorary Doctorate in Humanities by Hofstra University and that same year, the artist wrote an allegorical tale about color, Prism Moon to the Shaman. Jenkins received the Life Achievement award from the Butler Institute of American Art, Youngstown in 1997, as well as the medal of the City of Paris. In 1998, the Royal Cambrian Academy in Wales elected him an honorary member. For the 1999 Gutai exhibition at the Jeu de Paume in Paris, Jenkins wrote a text about his working with the Gutai in Osaka in 1964. Throughout this decade, the artist also worked in lithography at the Atelier Bordas in Paris, and created monotypes at Smith Andersen in Palo Alto. He participated in group exhibitions at Guild Hall Museum, East Hampton (1990); Tate Gallery, London (1991); L’Ecole Nationale Supérieure des Beaux-Arts, Paris (1992); Vancouver Art Gallery, British Columbia (1993); Stanford University Museum of Art, Stanford, California (1995); Galleria Civica d’Arte Moderna e cotemporanea, Turin (1997); Brooklyn Museum of Art, Brooklyn (1998); Haifa Museum of Art, Haifa (1999); and Fondation Maeght (1993, 1999). The year 2000 opened with an exhibition of his watercolors at the Butler Institute of American Art, Youngstown. The Artist’s Fellowship in New York awarded Jenkins its Benjamin Clinedinst Medal. An extensive exhibition of his works on canvas and paper, Viaggio in Italia, was mounted by the City of Vicenza in Palladio’s Basilica Palladiana. In 2001 he traveled to Kyoto to take part in the Fire Ceremony performed by Rev. Seiyu Kiriyama Kancho. Also in 2001 Le Centre d’Art Contemporain in Saumur exhibited a comprehensive selection of his recent canvases. In New York in 2005, the artist created a series of paintings shown at the Cistercian abbey in Roque d’Anthéron, France. Works on canvas were shown in his 2005 exhibition Œuvres Majeures at the Palais des Beaux Arts in Lille where he was also awarded the medal of the City of Lille. In 2006, the exhibition Water and Color was shown at the Arkansas Art Center, Little Rock. The following year, the artist donated a major part of his papers to the Archives of American Art of the Smithsonian Institution. In 2009, the Pollock-Krasner House & Study Center in East Hampton held an exhibition based on Jenkins’ Gutai collection of paintings by artists he worked with in Osaka in 1964. In 2010, the Crocker Museum of Art in Sacramento exhibited The Color of Light, watercolors together with selected paintings on canvas. Throughout the 2000s, Jenkins participated in group exhibitions at the Worcester Art Museum, Worcester (2001); San Diego Museum of Art, San Diego (2003); Jacksonville Museum of Modern Art (2004); Musée du Luxembourg, Paris (2006); Carnegie Museum of Art, Pittsburgh (2007); Telfair Museum of Art, Savannah (2007); San Jose Museum of Art (2009); UB Anderson Gallery, State University of NY at Buffalo (2010); Chrysler Museum, Norfolk (2012); San Jose Museum of Art, San Jose (2012); Palm Springs Museum of Art, Palm Springs (2013). Jenkins’ works continue to be widely exhibited around the world and are found in international museums and private collections including the Guggenheim Museum, the Museum of Modern Art, the Whitney Museum of American Art and the Brooklyn Museum in New York; the National Gallery of Art, the Smithsonian American Art Museum and the Hirshhorn Museum and Sculpture Garden in Washington, D.C.; the Tate Gallery in London; Centre Georges Pompidou in Paris; and the Stedelijk Museum in Amsterdam. In California, his work is found in the collections of the Iris and B. Gerald Cantor Center for Visual Arts, Stanford; the San Francisco Museum of Modern Art; the San Jose Museum of Art; the Berkeley Art Museum and Pacific Film Archive; the Palm Springs Museum of Art; the San Diego Museum of Art and the Crocker Art Museum. Jenkins is remembered today for his major contributions that rank him among the significant artists of the Post-War era. 1994 -L’Eau et la Couleur, traveling watercolor exhibition in France. 1987 – Musée Picasso, Antibes, France (retrospective). 1982 – Galerie Georges Fall, Paris. 1963 – Arthur Tooth & Sons, London.